Craft stores to me are like home improvement stores are to my husband. (although I love those too!) It seems like every time I go in one, I come out with something I didn’t intend to originally. Case in point…. 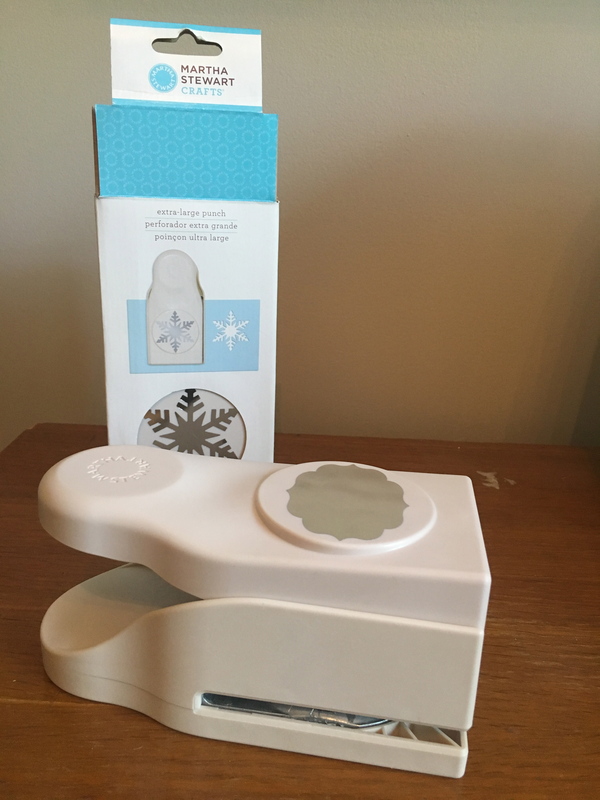 Last week while at JoAnne’s Fabric and Craft Store, I found these awesome craft punches by Martha Stewart. They are a bit pricey but they were 40% off. (originally $24.99 on sale for $17.99) They come in several sizes but I bought the largest ones. (they make 2.5″ cut outs) I figured I could use these in lots of different ways. So, I bought one in a snowflake shape (for winter and holiday crafts) and one shaped like a flourish label. There are several other brands too, but I love Martha Stewart products and find them to be of high quality, so I chose these. I also like these can stand upright for easy storage and the handle design allows you to press down to get better leverage and is easy on the hands. I have lots of plans for these craft punches later, but recently I used the flourish label punch to cut out name tags for the dog treats I made and gave to my neighbor’s dogs. I bought some thick stock colored cards as well. They were on clearance for $1.97 for a pack of 40 in different colors. I’m not sure exactly what they are supposed to be used for, but for making gift tags, they were perfect! I found I could get two label/tags out of one card. So, I punched them out and then used a round hole punch to cut a hole for the string. I used jute string to tie the treats together and put the names on them. So easy! This will be great during the holidays too! I can make my own gift tags for presents or homemade baked items for a personal touch. They would be fun used as labels for a buffet dinner or cheese tray. There are tons of different shapes that I’ll experiment with later when they go on sale again. Hmmmm. Maybe stick some snow flakes cut-outs on my Christmas card envelopes? These would be great for decorating scrapbooks too! Crafts for the kids or school? Lots of possibilities! Have a great day! Old Jug Converted Into Cute Cork Lamp! Credenza turned into Media Cabinet!